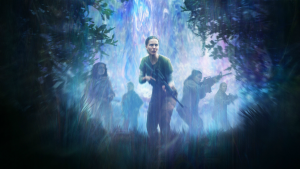 Annihilation is writer/director Alex Garland’s film adaptation of the acclaimed science fiction novel by Jeff VanderMeer. Claire White and Kyle Willoughby have been looking forward to the movie since they saw the first teaser trailer last year. Claire starts off by exploring the history of aliens in pop culture. From the Ancient Greeks to Arrival she discusses how the fears and beliefs of the time affect the shape and motives of fictional extraterrestrials. Kyle talks about what inspired VanderMeer to write the book and takes a look at the varied career of the director, Alex Garland. Our hosts conclude with their thoughts on the movie, how faithful adaptations should be to the source material, and why they want it to succeed.